When your clients most need a reassuring hand to guide them, your website may be the first point of contact they have with your funeral services business. Ensure that your online presence is as professional and dependable as you are with the Funeral Home WordPress theme. 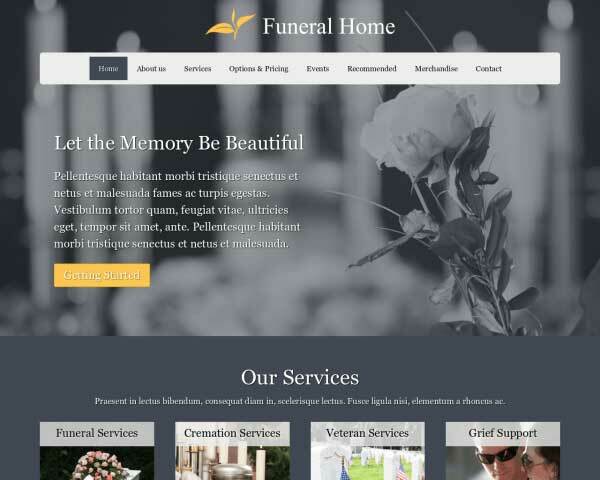 Presenting your funeral business online with a professional, respectful and easy-to-navigate website is within your reach when you start with the Funeral Home WordPress theme. 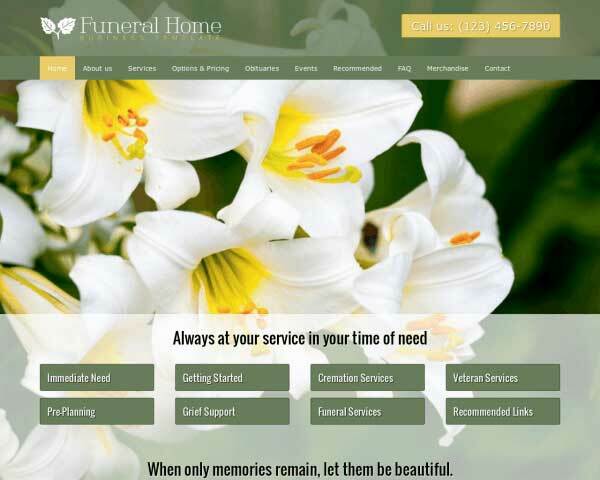 Designed with the needs of the funeral industry in mind, our website template is also useful in building websites for cemeteries and cremation services who want to offer important information to clients with sympathy and support. Included in this premium theme are pages for details about your services and merchandise, upcoming memorial services, and recommended resources for those in mourning. The built-in blog feature is ideal for listing obituaries, and even the FAQ page is already set up with clear distinctions between the questions and answers, so all that's left to do is replace the content from the demo site with your own text and photos. 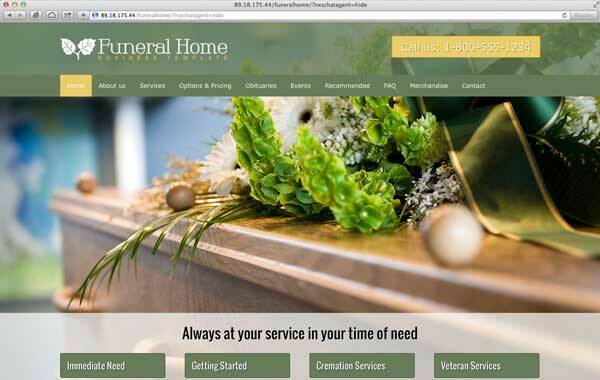 The colors and layout of the Funeral Home WordPress theme are simple to customize with our unique front-end editor, so you or your web designer can have your site up and running in no time, with no coding required. 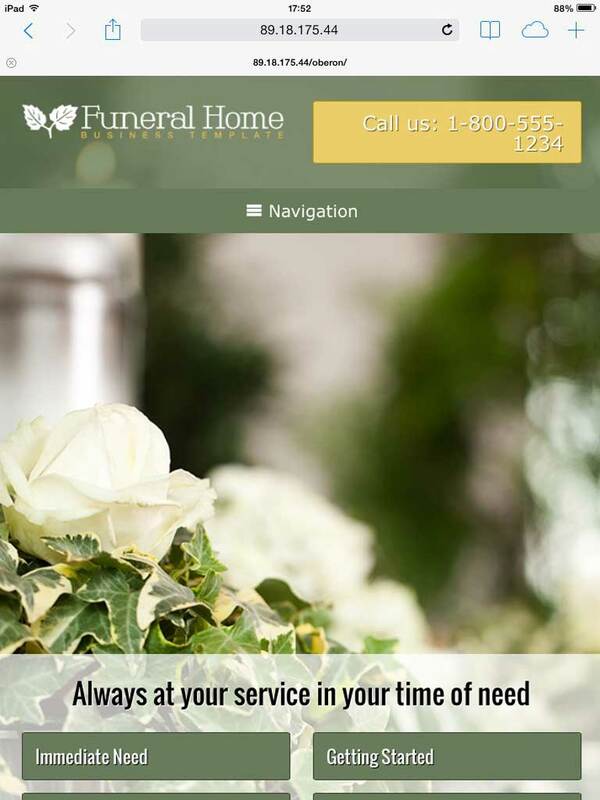 When clients find themselves in need of your services, rest assured that your website will offer them an appropriately reassuring and informative first point of contact with your funeral home. Offer clients your suggested resources for coping through a difficult time. The Recommended page on Funeral Home WordPress Theme is ready for your text. The Funeral Home WordPress Theme has a clean and professional design that can be easily adjusted to suit your company's own specific design needs. The Funeral Home WordPress Theme has a dedicated page for the various events your business might host for potential clients. With clear distinctions between the questions and answers, the Funeral Home WordPress Theme's FAQ page is ready to be filled with your most frequently asked Q's and A's. 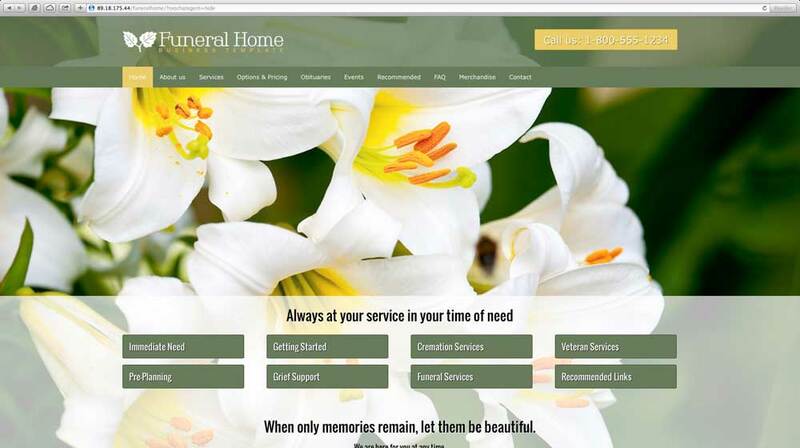 Show visitors a one-glance overview of the top brands you use and sell at your funeral home on the products page. The Funeral Home WordPress Theme would not be complete without a section for featured articles and updates about your business, which is why this theme comes with a WordPress blog. 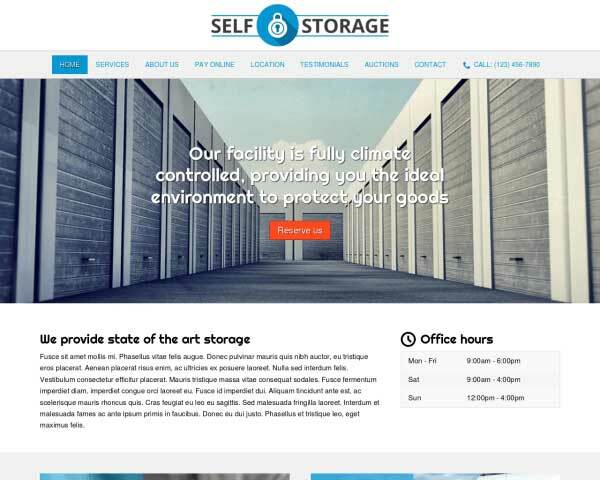 The clean layout of the Funeral Home WordPress Theme let's your website's visitor know instantly what solution you can offer for their respective problems. Individual pages are already set up for you to offer detailed information about each of your services on this WordPress theme for funeral home owners. The Funeral Home WordPress Theme comes packaged with sharing and following icons for popular social media platforms, and widgets that display a Facebook or Twitter feed. A staff page is already set up on the Funeral Home WordPress Theme. Just replace the photos and placeholder text to introduce each member of your team. When you use our responsive Funeral Home WordPress theme to build your website, you can be sure that visitors accessing your site from any type of mobile device will experience the same professional design and intuitive navigation of the desktop version. 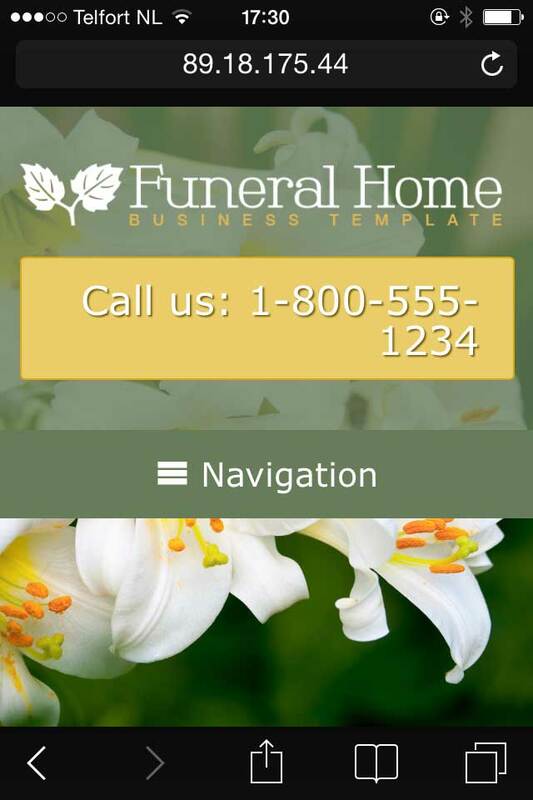 This website template for funeral industry websites is mobile optimized, meaning that your content will automatically adjust to neatly fit on any screen size, with no extra coding or special settings required. A versatile website that can be viewed from anywhere on any device is just one more way to extend caring service to your clients.